James always packs a lot into a small space. Let's focus on the center of this call to holiness: let's draw ourselves closer to God. When we come into God's presence and draw close to him, we know our thoughts, our motives, and our behaviors will be seen for what they are in the light of his holiness and righteousness. At the same time, we know that the devil is forced out by the radiance of our Father's holy life. Let's seek after God. Let's long to draw near to him. Let's ask him to cleanse us and make us wholly his and make us completely holy! Righteous Father, thank you for your love and forgiveness. Now, dear Father, help me as I seek to draw closer to you and as I seek to know you better. 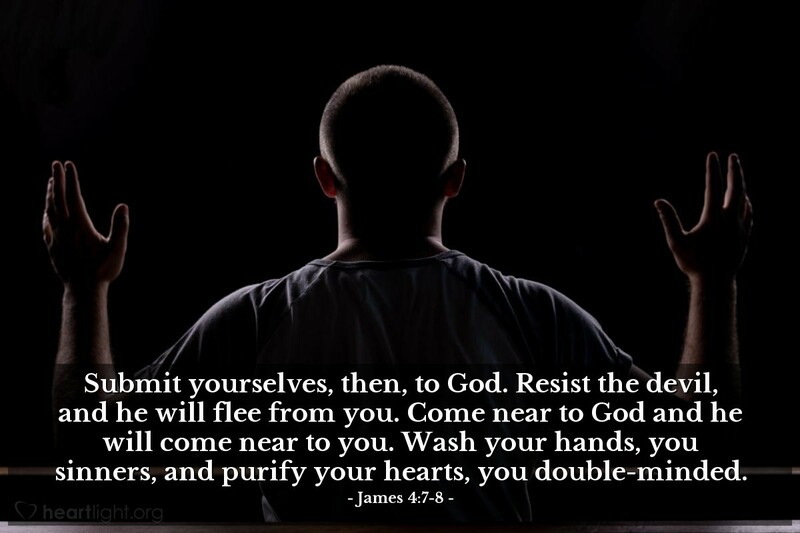 Purify my heart of any duplicity or secret sin. Cleanse my conscience and empower me to be an example of your grace and holiness. In Jesus' name I pray. Amen.